The Viru Bog, taken while strolling the boardwalk. This is the last in a series of Nadine Godwin’s posts from Estonia; you can read the others here and here. INSIDE LAHEMAA NATIONAL PARK, Estonia — In early September, I walked on a bog here. I hasten to add, given I was not adept at this, the walk was very short. Within minutes, I had gotten my boot buried past my ankle in the waterlogged moss that I was supposed to stay on top of. I was wearing bogshoes, which look like the aquatic version of snowshoes, but one boot — a knee-high rubber thing — had come unhinged from the shoe. While I don’t regard bog walking — I want to call this bogging — as my next favorite pastime, I was pleased to learn something about it because it is one of many windows onto life in Estonia, a tiny happenin’ northern European country on the Baltic. About half the size of Indiana, it gained independence from the Soviet Union in 1991. Its history is rich and engaging, as evidenced by, for example, the medieval city center of Tallinn, the capital. It has a place on the tech front, too: It is the birthplace of Skype, and 98% of the country is wired for free Wi-Fi access. And, it is a natural wonderland, which is where the bogs come in. 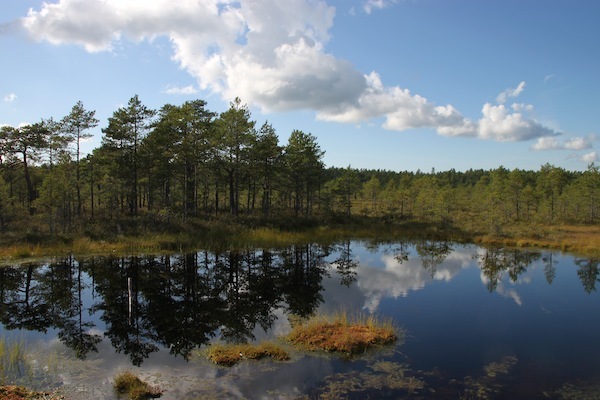 Fifty-five percent of Estonia is forested; 20% of the country is covered in bogs. It’s not a mountainous land, but there are 1,521 islands and islets along its coast. 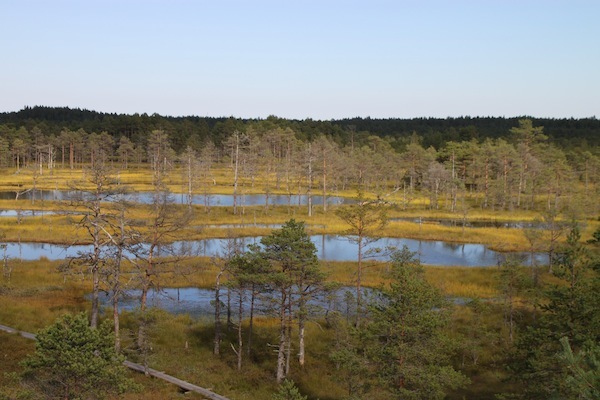 View of the Viru Bog in Estonia’s Lahemaa National Park. Much of the area is covered with waterlogged moss, but bogs can leave spaces for pools of water, too. 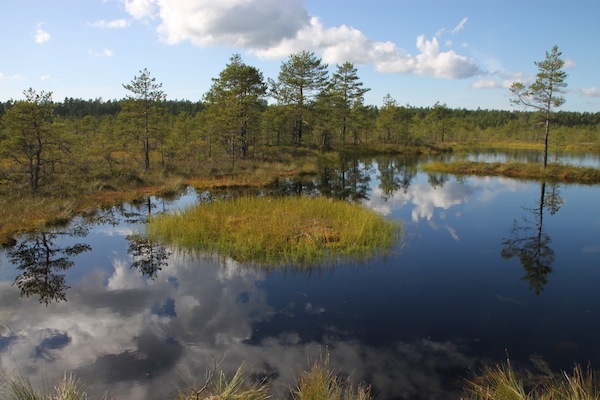 Bogs are wetlands characterized, in the case of colder lands like Estonia, by bog mosses that capture and hold rainwater. The water in such bogs is typically highly acidic and generally has few minerals, which means not much else — except highly adapted plants — lives here with the mosses. The thing is the mosses absorb lots of water (yielding an unsettling sponge-y sensation for the bog walker), take the minerals from the water and replace the minerals with acid. An unequal trade, one would say. The Viru Bog seen from the lookout tower. The bog’s boardwalk is visible in the lower left-hand corner of the photo. Some distance below the surface, not even a foot, the oxygen is effectively shut out, meaning decay is slowed or stopped. Peat is the partially decomposed dead moss found below the living plants. It is because of these conditions that archaeologists who dig in old bogs can find and study preserved bodies of people who died hundreds or thousands of years ago. But, back to the bog walking. I was with a press group when in Estonia. For our bog experience, we headed to the Lahemaa National Park, which has a 3.5-km/2.2-mile boardwalk that visitors can use to walk — without touching water — at a level slightly above the Viru Bog. 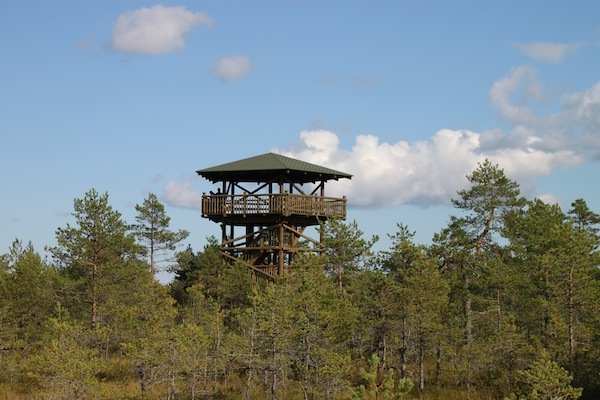 It also offers a lookout tower for viewing the landscape for some distance. Outfitters provide equipment for those wishing to walk directly on the bogs. VisitEstonia.com lists a few.